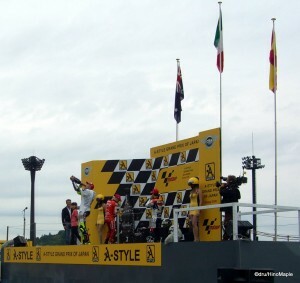 September 28 marked the 2008 A-style Grand Prix of Japan. 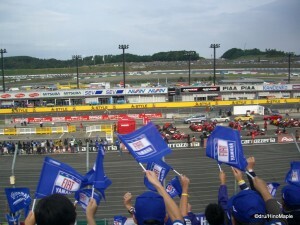 The A-style Grand Prix of Japan is the Japanese round of Moto GP. Moto GP is the premier league of motorcycle racing, equivalent to F1. This championship is, in my opinion, much better than F1. There is a lot of passing, and lots of excitement. Going to a true Grand Prix, you’ll be entertained with 3 different races and 3 different racers. There are 3 classes in Moto GP. 125cc, 250cc, and MotoGP Class. The 125s are the entry level for world class. Riders can be as young as 15 to a maximum age of 28. This is to promote younger talent to rise through the classes. 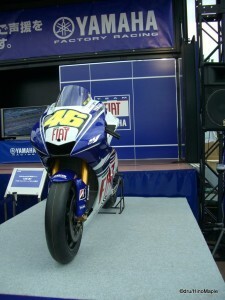 Generally, good riders will start in 125, move to 250, and finally graduate to the MotoGP class. It is very difficult as each class gets smaller and smaller. Going to a MotoGP race is an adventure in itself. The race is held in Motegi, Tochigi Prefecture, about 3 hours North of Tokyo. The track is nestled within the surrounding hills and mountains and it provides a good change in elevation. However, the track can be a little boring. Rather than have nice fast sweeping corners that allow motorcycles to pass, it’s a stop and go track that is better suited to F1. While it isn’t the best track for motorcycles, it is still a great place to go. I have been to 2 previous Grand Prix of Japan and I must say, this year was the best. Previously, it took a long time to get to the track and a longer time to get home. We got to the GP very quickly (almost record time) and returned home after the race in record time. If you do go, try to get a packaged tour. You tend to get free stuff and you don’t have to worry about driving when you are tired. This entry was posted in Motorsports and tagged 125cc, 250cc, A-style, A-style Grand Prix of Japan, Casey, Casey Stoner, Fiat, Fiat Yamaha, GP, Grand Prix, Grand Prix of Japan, japan, Japan GP, Motegi, Moto, Moto GP, MotoGP, Motorcycle, Prix, racing, riding, Rossi, Stoner, swag, Tochigi, Tochigi-ken, track, Twin Ring, Twin Ring Motegi, Valentino, Valentino Rossi, Yamaha by Dru. Bookmark the permalink.